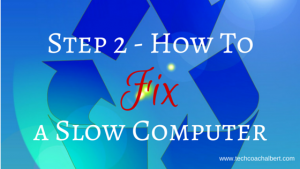 Are you tired and frustrated by your slow computer? Want to make your PC faster and want to know more on how to fix my computer for free? You’ve reached the right place! 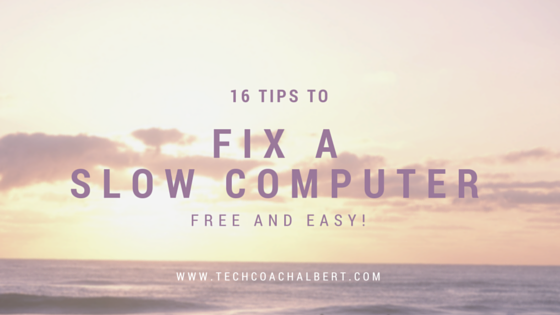 Here at Tech Coach Albert I’m working hard on teaching you the best ways to make your computer faster, fix that slow booting computer, how to fix computer viruses and best of all, how to fix my slow computer for FREE! 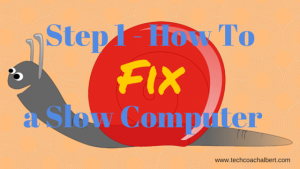 Most all the tips I give below are tried, true and trusted solutions directly related to the slow computer fix. Question! Are you more of a video watcher than a reader? If so, catch this on video here with my Slow Computer Fix video! Otherwise, continue on below for the details! So, let’s get right to the point. Below are the 16 BEST Slow Computer Fixes (in order of easiest to hardest) you can find, and most are free! I’ll be working on adding more in-depth guides for each of these ways to fix a slow computer. I’d recommend entering your email in the upper right corner (desktop) or down below (mobile) so you can be one of the first to know when the detailed guides are available! Rebooting your computer is simply turning it off, and then turning back on. This clears out loads of temporary data stored within your PC and believe it or not, this CAN (and does!) solve a lot of problems. So, give it a shot. Turn that computer off for a second to clear out those temporary files and speed up that old PC. For a more info, check this post on how a restart can fix a slow computer. Emptying your recycle bin is a commonly left out task that most people forget to do. When you delete something, it doesn’t actually get deleted. It goes in the recycle bin just in case you did it by accident. That item is still taking up storage space on your computers hard drive, and freeing up storage space means your computer has to work less to find that data it actually needs. So make sure you regularly empty that recycle bin! For more details, check this post on why emptying the recycle bin can make your computer faster. Just like emptying the recycle bin clears up the storage space on your computers hard drive, old programs that you no longer use also take up space and sometimes are even still running in the background and you don’t even realize it. Removing these old, unused or seldom used programs can greatly increase the speed of your computer. Head on over to your computer’s Control Panel and find the section to Remove Programs. Review that long list that appears and get rid of the stuff you don’t use! Still on the lines of cleaning up hard drive space, you can run the Windows Disk Cleanup utility to find temporary files, old backups that are outdated, etc to free up even more space on your computer’s hard drive. This can be found under the Tools tab when you right click on your Hard Drive that shows up in My Computer and choose the Properties option. Once you get all that junk removed off your drive from doing all the previous suggestions, you’ll want to defragment your hard drive. Basically, this refers to re-organizing all the data on your hard drive so it makes it easier for the computer to find what it needs. Think about your hard drive as a warehouse full of shelves and pallets of stuff. If you went through the warehouse and got rid of 1/3 of the pallets of stuff, wouldn’t it be much more efficient to re-organize the pallets closer together and get rid of the empty shelf space? Sure would make driving around that warehouse to get to your stuff much faster! Malware (as defined by Wikipedia) is short for malicious software. Which is any software used to disrupt computer operation, gather sensitive information, or gain access to private computer systems. And quite frankly, it’s becoming more and more of a threat to our everyday internet experience. This junk can just kill your pc. Getting rid of it is extremely important. Check out my full beginners how to guide on how to remove malware. Viruses, like Malware, also cause your pc to come to a screeching halt. They’re designed to use as much of your PC’s power to do THEIR job of continuing to spread the virus rather than let you do what you want. A good virus solution is always recommended, and this is what I recommend including a full guide on how to install it and use it. Not only do we need to clean out the clutter within our computers operating system, we need to clean out the dirt and dust that’s physically INSIDE our computers tower/case! Excess dust will restrict airflow in the case and prevent the computer fans from cooling down computer like it should. Thus making everything hotter, and heat is NO GOOD! Regularly crack that case open (careful, this may void warranty) and take it outside with one of these can’s of air and blow the dust out of that thing! Keeping your Windows Updates up-to-date is important as well. It patches up holes that the bad people find in the operating system that they use to spread viruses and malware. So this is important we keep up to date. Check your PC’s control panel for the Windows Update feature and make sure it’s either set to automatically download and install updates or set a reminder to do it yourself every week. Not only do we want to keep your computer operating system up to date with Windows Updates, we also want to make sure the hardware on our computer is using the manufacturer’s latest drivers. These can sometimes speed up or fix reliability issues with various hardware pieces in your computer like your video card, sound card, etc. If you’re a little more computer savvy, you can check out what programs are loading during the startup of your computer. This is what causes that bootup time to be so slow! You don’t even realize the various programs you install sometimes are designed to automatically start when your computer turns on. Whether you use them daily or not! This is just a waste of resources and I suggest reviewing this list of startup programs once in a while to make sure it only contains the necessary items you need. You can run the built-in windows MSCONFIG tool, or look at third party software options, such as CCleaner which has a friendly interface to access the startup programs (not to mention, CCleaner does a boat load of other tricks to clean up your PC!). This is one of the few recommendations that will (most likely) cost you some coin. Most likely the RAM or Memory in your computer can be upgraded to a larger amount. And when it comes to memory, the more the better! These can generally be done fairly easily, check out YouTube for some walk-throughs on doing this. The only really tricky part is getting the CORRECT RAM for your particular PC, as most them are different! I suggest this tool from Crucial that allows it to scan your PC hardware to figure out what type of RAM you need. Then pop on over to Amazon to find the best deal! One of the more difficult things to do, but can REALLY cover most of the previously mentioned tasks is to reinstall your Windows Operating System. This isn’t for the faint of heart, and should be done by someone experienced with it. It WILL erase everything on your computer. So a good backup is extremely important! Talk to your local PC repair tech about this one. Shouldn’t be very expensive to do, if you want to go this route. But it will make that PC run like the day you got it, or even better! If you’ve got an old computer and none of these tips really made much of a difference, you may just have too old of technology to really make a difference. Software is constantly changing and requiring more and more resources, and sometimes there isn’t much you can do to speed that computer up if its really old. But, you can look at running a Linux Operating System on the computer. Something simple like Linux Mint has a quick and easy learning curve. You’ll need to do a little bit of research on how best to accomplish this task. But the good news is there is a lot of helpful sites out there for this. If you’re just needing the computer to browse the web and do email, this is a much cheaper route to keep that pc running quickly than buying a new one. Linux operating systems are designed to be very lightweight and better utilize the minimal resources from the computers they run on. There you have it. The 16 Tips to Fix a Slow Computer. Stay tuned for more in-depth guides on the various tips mentioned above. I want you to be able to do as much as you can to fix your computer for free and learn how to make a slow computer faster. Utilizing the tips mentioned above will certainly do the trick! Got any new suggestions? Questions? Did any of these tips work for you? Let me know in the ‘Leave a Reply’ section below! I LOVE to hear from you, chat with you, or answer any questions you might have! Hey wait! One more thing! How to find the programs I use? I don’t have anything specific at the moment. I know a handful of these applies to both Windows and Mac. But, let me see what I might be able to find for you! Ok friends. My home PC takes 50 seconds to turn on. Who’s got me beat? What’s your time?!? If you wants to get better speed from your computer, its highly recommended to increase the RAM size. Random Access Memory plays an important role in defining the speed of a computer system. For e.g. if your computer have a great CPU like but RAM is very low like 512MB, performance of system will remain low.So you need to increase the size of RAM in order to get most out of your system. Its highly recommended to install 64-bit operating system, if your system have 4GB or more RAM. Absolutely agree. RAM makes a significant difference in performance! I just updated the RAM in my ThinkServer media player this weekend. Easily notice the differences! IF you decide to go over 4Gb of RAM it’s not only recommended, it’s required to be using a 64-Bit operating system. Otherwise, the RAM above and beyond the 4Gb mark is ignored. Thanks for stopping by and checking out my page! I like the tip about emptying the recycling bin. I forget to do this a lot. By the time I get around to it, I can’t believe how much space is saved. Hopefully, this will keep me from buying a new computer. Awesome Cheryl. If I can help by saving you a few bucks from not buying a new computer, I have accomplished my goal! 🙂 Thanks for stopping in and reading. Feel free to ask any questions you may have, and don’t forget about that recycle bin! My computer has been super slow lately, and it is really starting to frustrate me. That being said, I really appreciate you letting me know that cleaning up my hard drive and making sure I have no viruses will help me out. I’ll make sure I take some time to do this and hopefully it’ll help me out. Thanks a ton for the help. Thanks for stopping by and taking an extra moment to leave a comment! I certainly appreciate it and good luck getting your computer going a little faster! I think that you have some great tips here to make my computer faster! However, I do have a small question. Since I have a lot of computer programs installed that I don’t use, how do I know if any of those programs are important? My computer came with a lot of bloatware that has the same installation day as essential programs used to keep Windows running properly. Is there an easy way to tell these types of programs apart? Tip number thirteen seems like a good idea for me. My system took around 3.5 minutes to finish loading. I would like to time my computer with an SSD in it. I do a lot of writing for work on it, so speeding it up would help my productivity. Thanks for the tips. I can’t believe how big a difference switching to SSD makes. I was doing some comparing on a new PC that had both (came stock with a normal spinning drive) and then I was swapping out to a SSD. Boot times were cut down at least 75%, on the same machine, same Operating System, same everything else. Plus, I can run multiple disk-intensive programs at the same time and not experience ANY slowdowns. That is a huge benefit as well. Thanks for stopping by and leaving a comment! I’m curious to know what your before and after load times are as well!! Thank you for the tips on how to fix a slow computer. I think a lot of computers now days are better at handlinging a lot of processes at once. I remember that the computers in the past were terrible at being quick. We take for granted this type of technology and I hope we all can be appreciative of the better technology. Thanks so much for stopping by and dropping me a comment. I appreciate it! Computers are certainly MUCH better at multiple processes these days. The fact a Single Processor can have multiple cores has made a tremendous impact on the PC world! Thanks for the help. My computer has been going incredibly slow. I think I may need to have some repairs done soon. I love the idea of upgrading to a solid state drive. I have heard that is a great improvement in speed. I’ve noticed that my computer has been a bit slow and I’m not sure why. I didn’t know that maybe just emptying your recycle bin could speed things up. I’ll have to try that to see if it can free up some space! Thanks for stopping by and commenting! Make sure to check out the rest of the suggestions too! I have read your blog, the point which you given are quite helpful. I have read one blog too, which discuss the same issues which you have mentioned. I run 16GB of ram , on a SSD Drive , takes me less than 10 seconds i bet. That is interesting that you would recommend emptying your recycle bin on your computer to free up space. I am glad to know that you should restart your computer once you have completed updates to ensure that they are working properly. Thank you for sharing your advice on the many ways you can repair your computer easily. Thank you so much for stopping by and checking out my suggestions! I certainly appreciate you taking the extra moment to leave a comment. Let me know if there is anything I could help you with! My computer has been very slow for the last while and so I really appreciate all 16 of your tips. The one that I find especially useful, though, is the one about viruses as I expect that my computer has a few of those. Thank you for linking me to the anti-virus tool that you recommended! My computer has been really slow, and I was looking for ways to help speed it up. I’ll make sure to take your tips, and clean it of any bad malware, and viruses. I’ll also get more ram installed. That way I can free it of any bad entities, and speed it up with more memory. It’s interesting how dust and dirt can slow down my computer. That’s probably one reason why my laptop has been really slow lately. I haven’t dusted inside of it yet, so I should do that if all of that built up dirt is preventing my system from cooling down properly. Thanks for the tips! Last time i got a problem that i have just 2 gb space free on my c drive. I tried to find solution of my problem. After huge search i got solution that my download manager stored many files with huge file size those i downloaded. Then relax and cleared. One thing that I despise is a slow computer. Everyone should be frustrated by that becuase they are buiilt to be fast. If my computer ever start to get slow I will be sure to take your advise and defragment my harddrive to make it easier for my computer to find files that I use. My computer has been running so slow lately, and I couldn’t figure out what it was. You mentioned that the computer might need updates, and that might be the problem. I always put off the updates because they take a long time. I guess you probably shouldn’t put those off in case they help performance. Thanks for the advice! These tips are really useful, i particular liked the RAM one as that is the most effective change i have made to my computer. I recently found an article by IT engineers who said that these are the top 10 things they do when they get given a slow computer-http://www.lucidica.com/blog/how-to-guides/10-quick-fixes-for-a-slow-windows-computer/. A lot of these are not just the generic solutions and actually involve opening programs that i had previously not heard of. All of these are relatively easy and not time consuming. If you are having problems with your computer speed both of these articles are definitely worth a try! I never thought about removing programs that you aren’t using from your computer, that’s something that I’ll have to try. My computer has been having a lot of issues lately so I have been thinking about taking it in to get it looked at. I’ll have to keep these tips in mind in the meantime, thank you for sharing! Thanks for the great tips for fixing a slow computer. I know it sounds terrible of me, but nothing is more annoying than a slow computer! Call me impatient, but it’s true. I had no idea that the recycle bin could even be emptied, so I’ll try that. Next story Shout out to Anker’s Customer Service and the Anker Warranty!